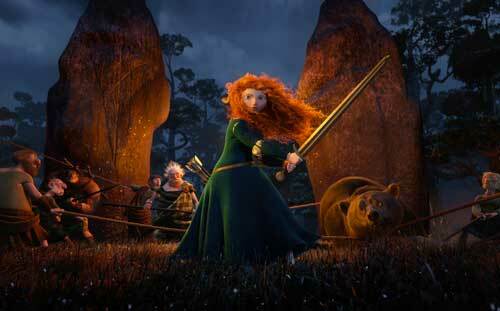 Pixar continues its run of acclaimed animated films with Brave, featuring a tough teen girl who’s more comfortable with a sword than needlepoint. Voiced by Kelly Macdonald (TV’s Boardwalk Empire), Merida is a Scottish princess who’s destined to marry the eldest son of of another family to keep peace in their area. But the headstrong teen has adventure on her mind. Feeling desperate, Merida goes to a witch and purchases a spell that will make her mother (Emma Thompson, Nanny McPhee) change her mind about the wedding. But it transforms her mother into a large black bear, the dreaded and hunted animal of Merida’s father (Billy Connolly, Gulliver’s Travels) as well as every other man in the area. While she tries to reverse the curse, Merida also must keep her disguised mother safe. And along the way, they just might learn to understand each other better. Julie Walters (Gnomeo & Juliet), Robbie Coltrane (Harry Potter movies), Kevin McKidd (TV’s Rome) and Craig Ferguson (How to Train Your Dragon) also voice characters in the PG-rated film. Brave grossed a whopping $229 million when it was in theaters, riding on good reviews from critics, who said the movie isn’t as good as earlier Pixar films but is still collection-worthy. As Denver Post critic Lisa Kennedy said, “Saying that Brave is entertaining but not astonishing is pretty much admitting your straight-A student got a B.” This Disc Dish critic gives the film at least an A-minus. Brave is available as a single DVD, a three-disc Blu-ray/DVD combo and a five-disc Blu-ray 3D/Blu-ray/DVD combo pack. The Blu-ray 3D also offer the “La Luna” short film in 3D and a downloadable digital copy of the movie. And both Blu-ray versions show the high-definition Brave with Disney’s customary 7.1 audio. The DVD has 5.1 Dolby Digital. Pixar’s Finding Nemo makes its Blu-ray and Blu-ray 3D debut in December.